My two preferred rental agencies are National and Hertz. 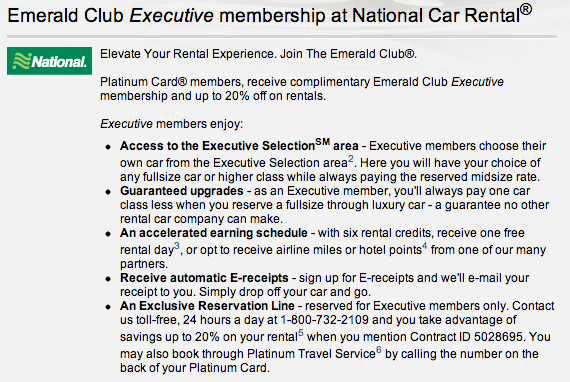 National doesn’t have the best rewards program in my opinion, but I do love the Emerald Aisle, which lets you elites pick their own vehicle. Hertz seems to make it a little harder for me to bypass the counter but offers generous points-based rewards. When arriving and departing at about the same time, like on most trips, I can book a car for multiples of 24 hours and pay a daily rate. However, a same-day change with United moved my arrival time four hours earlier, and there was no way I could return the car in time without missing some of the afternoon sessions. It’s times like that when I am really glad most car rental reservations allow you to cancel without charge. Plus, rates fluctuate enough that I am always checking and rebooking if necessary. As much as I like the convenience of renting from National, they don’t offer a grace period if you need to return the rental a little late. After each 24-hour period, you are charged an hourly rate, which is half the daily rate. A rental of 49 hours will be billed for 2.5 days. A rental of 50 to 72 hours will be billed for 3 days (assuming you booked it that way and don’t just show up late). So in this case I switched to Hertz. With my Amex Business Platinum Card, I get a special rate code (CDP 211762) that includes up to a 20% discount as well as a 4-hour grace period. These and other American Express Platinum travel benefits are summarized on a protected page, but I’ve copied them here. My daily rate after switching from National to Hertz was about the same. I don’t often shop based on price as long as the rates are comparable and it’s a company I like. Renting a car can be such a hassle that I care more about being able to avoid the rental counter and save some time — my primary reason for avoiding discount companies. But I just could not stomach paying a full extra day for a few hours more. That car is unlikely to be going anywhere, especially over a weekend. Platinum cardholders get benefits with Avis, Hertz, and National — the big three — but only Hertz offers an extended grace period, which may lead to more bookings with them in the future. Avis matches National by charging a half-day rate for each additional hour. Alamo charges a slightly lower hourly rate of one-third the daily rate, and Enterprise charges one-quarter the daily rate. Hertz actually has a 29-minute grace period for all rentals, as does Budget. Payless and Fox offer 59-minute grace periods but are among the more serious discounters; I sometimes only find them at off-airport locations. You can learn more at Best Car Rental Tips, which also has a great list of current discount codes and online coupons.